I’m on a total puy lentil kick at the moment. Ever since I discovered the little sachets of pre-cooked lentils, I can’t get enough. 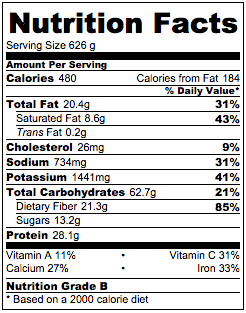 They’re like healthy convenience food. My excuse is that it’s pretty hard to find the dried kind here, otherwise I’d boil them myself. 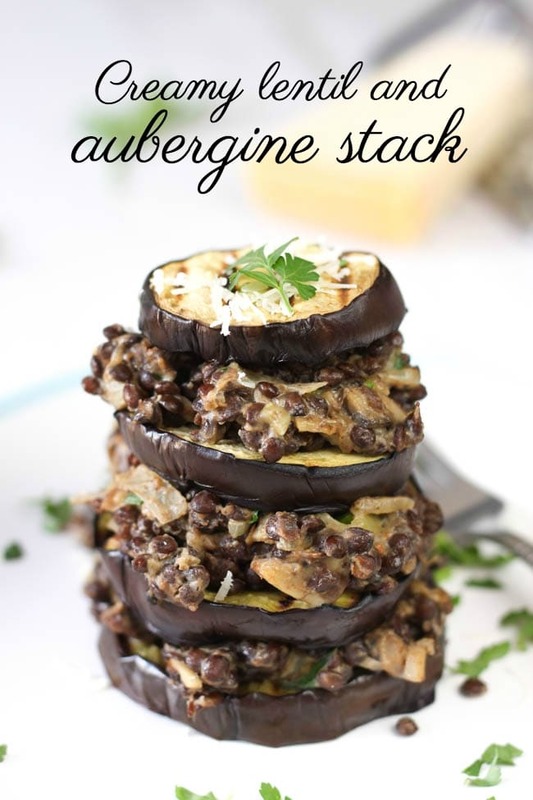 But even if you can’t get the sachets of pre-cooked lentils, you can still make this lentil and aubergine stack. Just boil your lentils as you usually would, then cook the recipe as written. 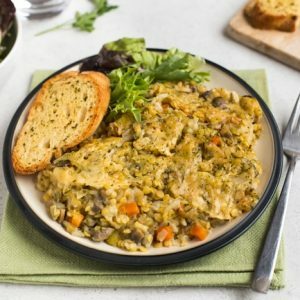 You can even use leftover lentils from the previous night’s dinner if you need help to justify the extra step! I find puy lentils much more flavourful than some other lentils. Red lentils are great with added spices, whereas puy lentils are pretty great on their own, just boiled simply with a couple of bay leaves. They’ve got a much richer, heartier flavour. Of course, I still added extra flavour to the lentils in this dish (when has extra flavour ever been a bad thing?). 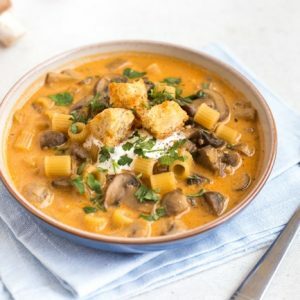 Onion, garlic, chestnut mushrooms, parsley… and of course, a dollop of cream cheese to make everything nice and silky. 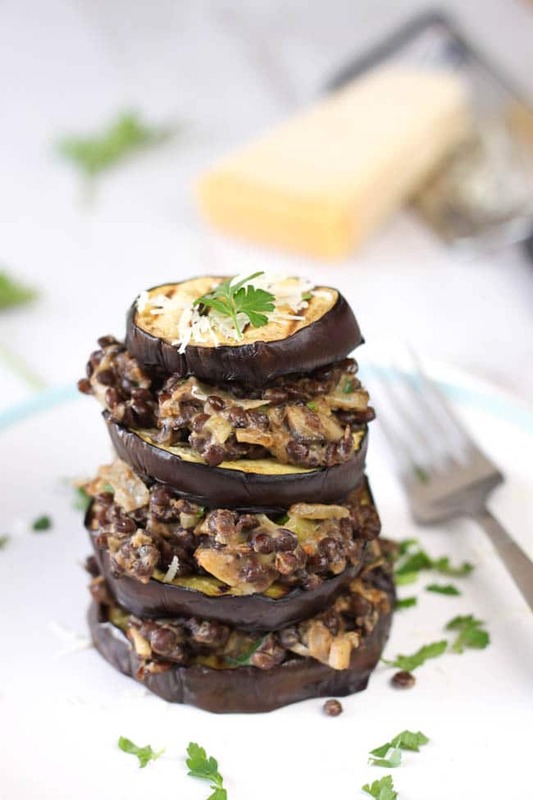 Stack it up with some griddled aubergine, and you’ve got yourself one elegant eggplant. This aubergine stack would make a great appetiser for a dinner party – or a main dish, if you serve it with a green salad and some garlic bread. 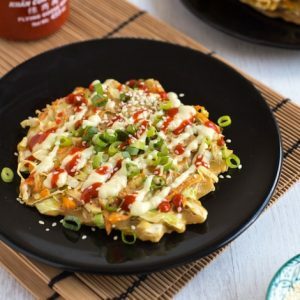 It looks pretty and impressive, but it’s very simple to make, and it isn’t even tricky to stack up – the touch of cream cheese in the lentils helps to stick everything together. So there’s no danger of your stacks collapsing on the way to the dinner table (who, meee?). The best part, though, is digging in. 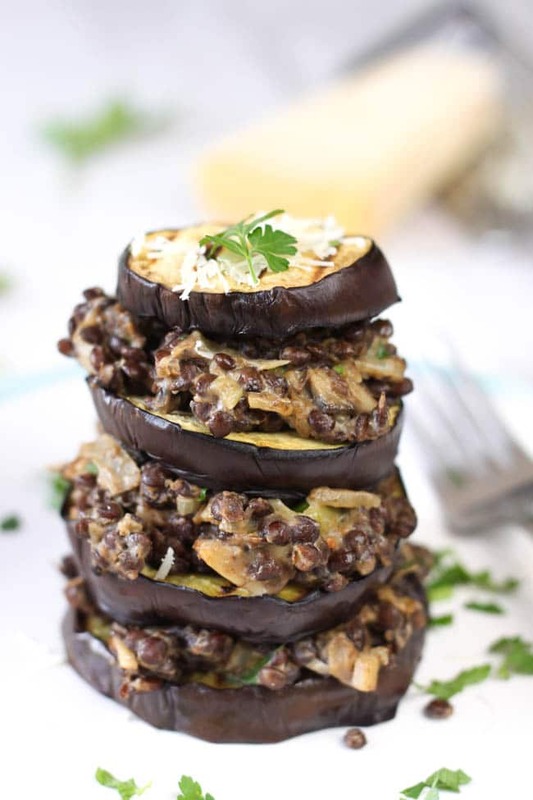 There’s something strangely satisfying about taking a beautiful, neatly stacked tower of aubergine and lentils… and then knocking it over with a fork. Lightly oil a griddle pan, and add the slices of aubergine. Cook over a fairly high heat for a few minutes each side, until dark char lines appear. Heat the oil in a large frying pan, and add the onion and garlic. Cook over a medium heat for a few minutes, stirring regularly, until slightly soft. Add the mushrooms, and continue to cook for 5 more minutes, until the vegetables are soft. Add the vegetable stock, cooked lentils, two whole bay leaves and plenty of black pepper, and bring to a simmer. Allow the mixture to bubble for 5 more minutes, or until most of the excess liquid has evaporated. At this point, remove the bay leaves and turn the heat down fairly low. Add the cream cheese, and allow it to melt into the lentils, stirring gently. 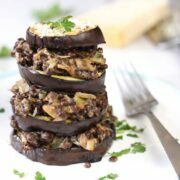 Add the parsley and parmesan, stir until the cheese has melted, and stack in layers with the griddled aubergine. Serve topped with more chopped parsley and grated parmesan if desired. I go through some serious puy lntil phases too so this stack is high on my to do list. It looks amazing and very healthy too! 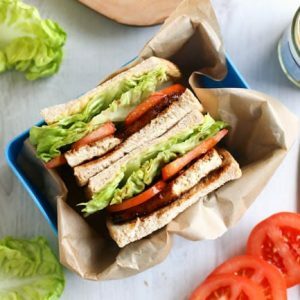 I love the look of these stacks, will have to have them for a meat free day very soon. I’ve never actually tried pre-cooked lentils and it’s a long time since I ate puy ones, but this looks lovely, nice change from cheese. Becca! 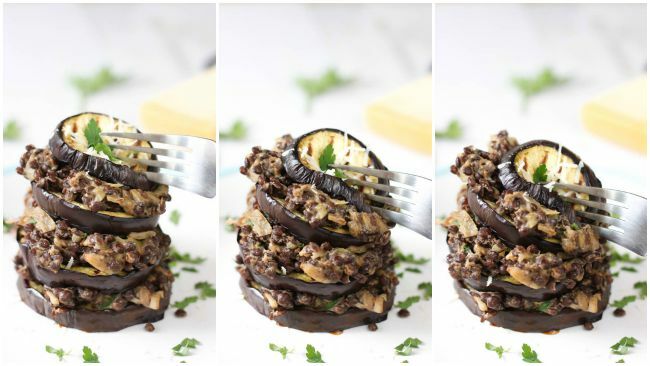 I’m by no means a lentils girl, but your amazing photos of this stack of aubergine and lentils is making me drool! 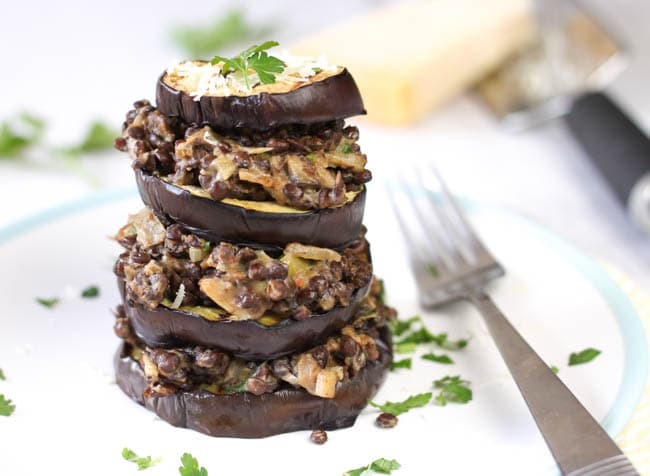 I think I might make this sometime soon, but possibly with minced beef instead of lentils! 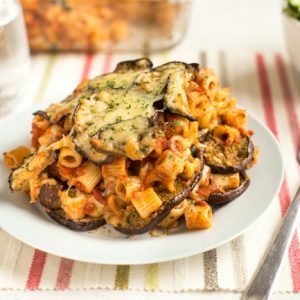 My husband isn’t a fan of aubergine but I think he would eat this. 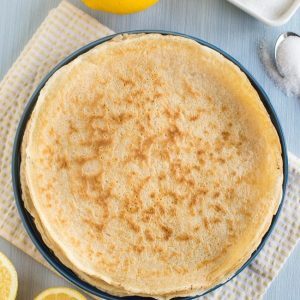 It looks yumt to me! Becca, I’m on a total lentil kick too since I went plant based! 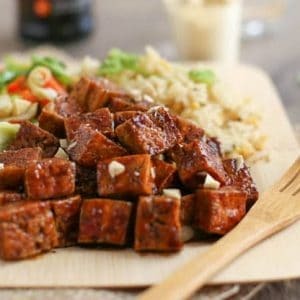 So much flavor and texture in those little things! 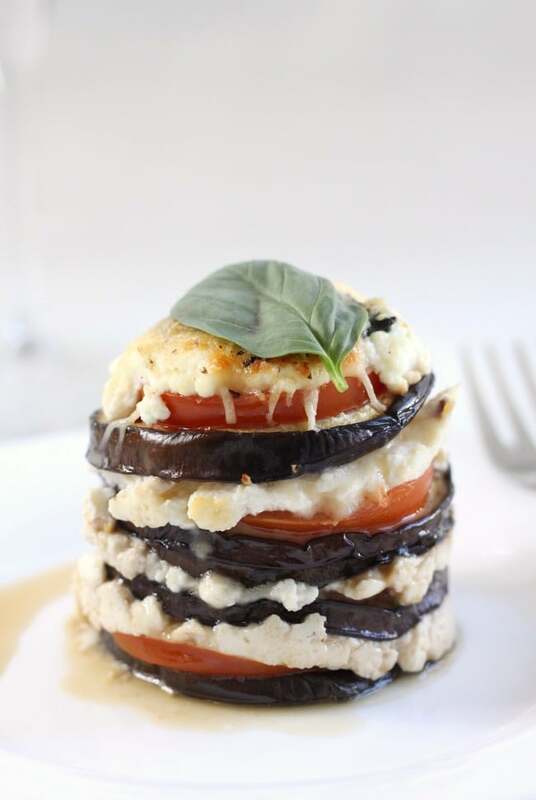 And what an awesome and creative way to use eggplant! I get so many ideas from you honey! Love the pictures too!